Luck shone on the Latvian women with 2 wins in the morning games, but the Estonians also picked up one against their southern neighbours. Marina Shaulene’s 18 points and 9 rebounds made no difference for the Lithuanians as Tukums seized the game 54:46 against Augma Baltic in W50 age group. Centre Zane Rozite dominated the paint for Tukums with 15 points and 13 rebounds for the winners, supported by 12 points from Tatjana Kirilova. Rigas Satiksme had no trouble taking out the game against Radviliskis in the W40 age group 95:21 with Ilze Dukate scoring a massive 33 points with her 12 rebounds, Zanda Redala adding 18 points and Ilze Ose Hlebovicka 15 points. 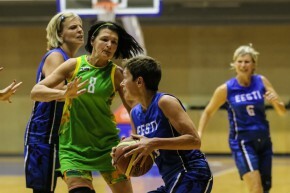 Renata Radisauskaite scored 8 and picked up 6 rebounds for the losers. Estonia walked over Livani, taking out 3rd place in the Cup for the W35 age group, 66:41. Helina Esnar showed fine form with 25 points and 11 rebounds for the winners, helped by Sheila Kodanik’s 13 points, while Raalika Laes contributed 11 points and 7 rebounds. Iveta Aispure picked up 12 points for the losing team.